Galvanised size 8, 48.3mm fitting for attaching mid rail at corners to produce a ninety degree turn of direction. Tube needs cutting to length be attached in clamp fitting. Mid rail corner fitting for tube clamp handrails. Size 8 (48.3mm diameter) mid rail tube fitting. Galvanised fitting for mounting mid rails on tube handrail Rail needs to be cut down to size before fitting into clamp. 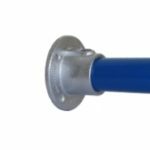 Galvanised elbow fitting for use with size 8, 48.3mm tube. For use with size 8, 48.3mm tube. Galvanised ninety degree corner piece for use on the top rail. Suitable for use with size 8 handrail (48.3mm diameter). Use on end posts or top rails. Not for use where the tube needs joining within the fitting. 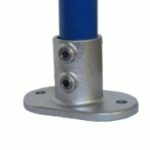 Long tee joint for handrail, galvanised finish, for use with 48.3mm diameter tube (size 8). Suitable for use with size 8 tube (48.3mm diameter), requires four fixings to mount to wall. Bolt down fitting for mounting kee klamp style tube handrail to concrete steps, plinths and surfaces. Requires two studs for fitting. Hand Rail Tube Size 8, 48.3mm Galvanised Tube available in a 6.4m length. 2.5mm wall thickness. 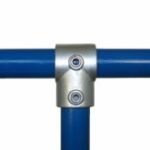 Tube clamp metal handrails systems are ideal for preventing pedestrians from walking into vehicle lanes and reducing falls from height hazards. These systems are ideal if you want to prevent people from falling off loading bays, inadvertently slipping on steps or exiting doorways directly onto vehicle lanes. 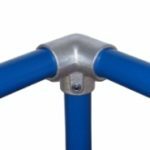 These metal handrails are not designed to stop vehicles from hitting pedestrians – they offer minimal crash protection, see our armco supplies for suitable crash protection. 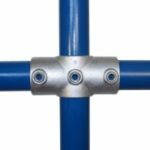 Tube clamp systems are incredibly easy to fit and can be quickly installed by anyone. If you have a concrete plinth you can simply bolt the tube clamp to the plinth using proprietary fittings. If you have tarmac or soft ground conditions you can concrete the tube clamp into position with little difficulty. Most metal handrails systems are 1.1m high have a top and mid-rail and posts at 2m centres. 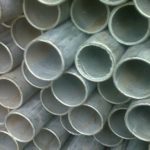 Galvanised tubes are supplied in 6.4m lengths that can be cut to suit posts and rails. Our system is a size 8 system. This means the tubes and clamp fittings are designed for a tube with an external diameter of 48.3mm. Our size 8 system is interchangeable with other manufacturers size 8 systems and components. We supply all the components you need to create your own handrail. 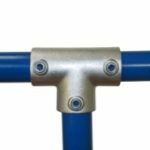 We have a range of clamps that can be used to create handrail on flat terrain. If you need clamps that can be adjusted to suit incline and declines please call us with your details and will be able to offer either hinged or fixed clamps to suit your ground conditions. 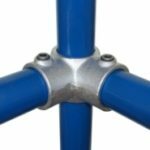 We also have an extensive range of bolt down fittings including palm fittings, raked and hinged bolt down fittings. If you don’t see the fitting you require on our page give us a call as we have over 30 fittings that you can choose from to suit your ground conditions. Clamps are easily attached to rails by means of locking screws built into the clamps. Locking screws can be operated with a hexagonal key. 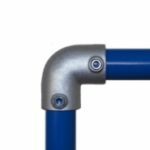 If you have a handrail that needs to reach a DDA standard – warm to touch – we can supply powder coated rails to suit in colours or your choosing. Please call with your requirements and we will be pleased to offer a quote. If you are looking for special clamps, need an item that doesn’t feature in our online catalogue, need a price for supply and installation or need any advice on items in our range please call on 024 76 588 904 with your enquiry. We have quick response installation teams that operate nationwide.